From time to time on Flutenet, we receive requests for starter-pack information from adult re-beginner flutists. These are folk who once played flute in highschool, or as a child, and would like to return to the instrument for the love of it. On the four or five Flute Discussion Groups I'm on, we see this request about twenty or thirty times a year! So I thought I'd write up some info. here in the old flute 'blog, so that the best hints for success were all in one place. 10. Continue to learn, investigate, ask questions, and be creative. If each of the above steps is followed even to a small degree, and none are missed, the joy of fluteplaying will be in your life for many years to come. However, if you don't follow up on some of the steps, it's easy to get bogged down, and start to feel as if you're back-sliding again. We all want to avoid a feeling of frustration (believe me, as a flute player for 34 years, I know all about frustration and backsliding...hahahhahaa! It's the human condition! ;>) ) so follow the reasoning on each of the steps, and you'll soon find yourself zooming happily along on your flute. This is covered in my adult beginner info. page as well. A leaking headjoint cork, or a host of leaking pads will frustrate a beginner flutist very quickly. The flute sounds muffled, dull? The keys are hard to close without alot of finger pressure? Then take your flute to the best repair place. Phone the top players in town, and/or top flute teachers (you'll be calling the flute teacher asking for lessons later too; so, two birds/one stone! :>) and find out who to send your flute to. Within a week or so (sometimes same day service while you wait) you'll get a flute back that's working perfectly. Do it. Don't try and play on a leaking flute. It'll only make you think that YOU'RE the problem, when you're not. You can also check your own flute to prove that a repair visit is needed. But do it. Alot of flute playing problems in beginners are caused by the instability inherent in the balancing of the flute. Afterall it's one slippery cylinder. ;>) You owe it to yourself to learn how to put the headjoint and footjoint on so that they ergonomically fit your hands, your face, your lips, your fingers and your own wrists and arms/shoulders. Learn how here, and ask your new flute teacher to observe and help with this too, later on when you start official flute lessons. The starting point is lining up the center of the blowing hole with the center of the keys on the middle section, and lining up the silver ball on the footjoint with the center of the lowest key on the middle section. From there you adjust the points to suit your own ergonomic needs. Flute playing is like a sport; if you start all gung-ho and try really really hard, you can really really hurt yourself if you're out of shape, have poor posture, have shallow breathing, and don't do any stretching or breathing exercises before beginning. In a flute lesson, this might be some of the first things you learn, so take note. There are some great stretches in Paula Robison's Flute "Warmup Book" which you can order in at your local library. Breathing exercises,simple stretches, specific musician's stretches, warmups (depending on your progressing level of playing, warmups can be novice level, intermediate and advanced), and basic blowing and posture information can be found online, but these things are best taught in a live flute lesson. Remember too about standing up to practice, with a tall music stand at eye level. If you're seated, for whatever reason, sit on the front edge of the chair, with feet flat on the floor, and the chair turned 45 degrees to the right on the music stand, so that the face and flute face the stand, but the knees and hips turn to the right. All these things will help you ease into a new posture comfortably, without strain or fatigue. There are a few books that cover the fundamentals of flute playing. A particularly good one is Vernon Hill's "The Flute Player's Book" which has alot of exercises on each skill up to the intermediate and advanced levels, and a CD demonstrating all the exercises. This book has great photos too. Another handy book to start with for beginners is by Howard Harrison and is called "How to Play the Flute". There are fun cartoons and great tunes to play with all fingerings given etc.. Here are some other adult beginner books. And if you need pointers right now, check here for beginner skill articles. 5. Get a few re-introductory flute lessons that cover the basics and give tips on how to reinforce the best and quickest flute exercises. This is the most important thing you can do to speed up your flute playing skills. Finding a good flute teacher is the smartest thing you'll ever do. Your new flute teacher will help in all the areas from one to ten in this list, including helping put you in touch with other flutists and musical groups to play with. Don't just think about it. Do it. :>) There is nothing revealing than to finally go to a flute lesson and find out that the very problem that was holding you back could have been solved in less than 30 minutes. Don't bother muddling away on your own if you're willing to admit that you're wanting lessons. Great flute advice is only $20-$30 and half an hour away. :>) You'll save loads of time and frustration by going to the experts. Afterall, if your pipes burst, you don't try and teach yourself how to fix your own plumbing; you call in an expert. Then you watch THEM fix the plumbing, so you'll know more next time. d) you'll get such great feedback from the activity of actually playing music, no matter how simple, no matter how basic, it will be MUSIC IN YOUR LIFE! These things are all aided and abetted by the enthusiasm that comes from being with like-minded allies. Go for it. Alot of us try and learn in a vacuum, which may be fine if you're studying vacuum cleaners, but does not work so well when you're studying music which needs to be heard to be understood. Find out about local concerts of all kinds, and whether or not there are any flute-specific events you can attend. Listen to alot more music than you do now. 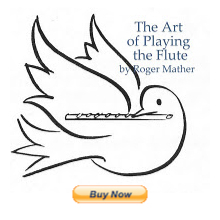 There are free online flute CD bits and MP3s to listen to that will instantly inspire you. Use your ears to enthrall and engage you in joining in. 8. Follow a flute learning system with progressive skill increases. There are more and more fun flute books coming out every day. Some of them have playalong CDs, some of them have pictures, diagrams, snippets of music to try, and alot of them have step by step lessons. Get your private flute teachers input on the best flute books that are currently available, and sort through some of the lists of recommended flute methods and flute books online. There are also a handful of free flute exercises and solos online that you can download and check out. That way, if it's a rainy day, and you want to progress on your own, you'll have all the materials at hand to make some musical breakthroughs. 9. Develop a libary of flute CDs, or flute sheetmusic or flute method books. Flute CDs for a desert island will give you some ideas of one or two CDs you can order right away that will thrill you to hear. If you have no budget for CDs, listen for free from time to time, until your next birthday present. As for flute sheetmusic, there are tons listed here. The flute books and methods, as mentioned above also make good "wish list" items for friends and relatives. If you're on a very very tight budget all the time, the cheapest flute method books and sheetmusic books are listed here. Many of us know the pitfalls of "getting stuck at one level", when our dream was to find it effortless and fun. Getting unstuck will happen alot faster if you ask questions, stay curious, and open yourself to all sorts of solutions. "I'm so talented! I'm such a dolt!" This, once again, is human nature. If you take your doltish self to what turns out to be a wonderful rehearsal of your beginner quartet, or your beginner band, or your beginner flute lessons or beginner flute duet rehearsals, and open yourself up to experimentation, the pendulum could quickly swing back to "OH my gosh, this music stuff is the BEST!" and that's what we all want. So don't hide inside that vacuum cleaner in the closet: get out there and ask and learn. "Gosh, how old will I be by the time I know anything at all about playing the flute?" Answer: "How old will I be if I DON'T learn how to play the flute?" All the best to the adult re-beginners out there! This is a great article! Anyone who wants to learn to play the flute these days certainly can by putting in the effort. Flute books with accompaniment CDs make it fun, too. When I was in junior high school back in the 1960s, I really wanted to play duets, but alas, no duet partner was to be found. So I taped myself on my tape recorder playing one line of the duet, then played along with the recording. The vast number of play-along CDs available today is a flutist's dream. Great to hear that you, by necessity, invented your own duet partner way back when. Thank you so much for your sound advice. I've just picked up my flute after 32 years of inactivity. Because I am living abroad, some of your advice is a little difficult (India) like trusting a flute repairman... :-) but I think that all of the valves are in working order. Just as Kathy said, I record myself to play duets! And I was so fortunate to find a How to Play Flute by Howard Harrison book in an obscure music/sports shop! All the best to you, and thank you again. You can always ship your flute for repair, and use a loaned flute while you wait. That's what I have to do as well, being 3 or more hours from the best repair person. If you can find out who is the top professional player in your geographical area, phone/email them and find out which flute repair shop they use. This is wonderful! I've bookmarked your blog - I'm an adult re-beginner, thank you! Thanks Jen! I last played 27 years ago. I've taken it out of the case a few times and played around with it. I want to make a serious effort again. I remember the joy of feeeeeeeeeling into my music. Blessings! Thank you once again, Jen! Your encouragement and advice is just what I needed to hear. Love playing my flute again after putting it aside for 30 years (the dog and hubby used to howl when I played!) There is no time like the present to dig in and enjoy making music. Your blog is a weekly read with a wealth of advice. Thank you! just want to say what a great site you have - after being enthusied by your site I am now playing in a local concert band, a good 20 years since I played at school! many thanks, and I am definately buying your book once its finished! Thanks so much Angela. What great news about your playing! Thankyou Igor. Glad to help. Great to hear. Good luck, and don't worry about being "slow". I took up the flute again after about 30 years, and joined a local volunteer band that welcomed new members who were looking to pick up their instrument again. I took the music home and would play along using you tube videos . it took me about 3 to 4 months to get back up to speed, but now I'm in 2 bands, and 1 orchestra (all after work) and love it. After 47 years, I took up flute again! I have followed your site diligently...learned how to get "brilliance" (at home), but have trouble playing in church...think it is not really knowing where to place the flute on my lips, so I often have no sound, etc. I am not giving up, and plan on conquering this problem!! Your website is truly amazing, and I love your sense of humor...would love to be close enough to take a few lessons with you! Nerves often affect tone in early first few performances. Don't worry it will pass. The Adrenalin becomes less with each public performance as the novelty wears off. Good luck, and thanks for writing.